SANRAL is influential in empowering women in construction and engineering. Kerisha Govender is a product of SANRAL’s bursary programme. 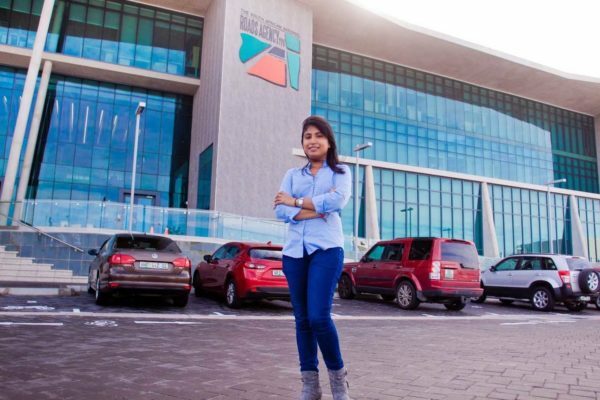 At the age of 24, Kerisha Govender is one of the shining lights at the South African National Roads Agency (SOC) Limited (SANRAL). She obtained a SANRAL bursary to study at University of KwaZulu-Natal and graduated with a BSc in Civil Engineering (with Honours) in 2014. Kerisha started working for SANRAL the following year. “I started my career as a civil engineer firstly by being seconded to a consultant to gain site experience. I worked on the Mount Edgecombe Interchange Upgrade project in KwaZulu-Natal from 2015 to 2016. What drew you to civil engineering? What did you hope to learn? “From a young age I have been fascinated with the systems of transportation, with major structures and construction works such as major interchanges and buildings, like those in Dubai and Malaysia. What’s the most interesting thing you’ve learnt in your curriculum this semester? “Despite obtaining my BSc degree in Civil Engineering (with honours), the questions did not stop. Thanks to the opportunities provided to me by SANRAL, I developed more interests in the specialist fields of Civil Engineering and my questions increased significantly in terms of complexity and focus. “So, I took the next step. I applied to join a Master’s in Engineering Programme in Transportation Engineering at the University of Stellenbosch in 2017. SANRAL supported my desire to specialise in the field of Transportation Engineering and encouraged me to further my studies. “I was also granted a full bursary, which covers my Master’s Degree. My first block module, as part of my Master’s programme, was Transport Economics. The course helped me understand how construction projects were evaluated in terms of whether they were viable or not. This was dependent on the amount of benefits that each alternative of the project generated. Have you learned about blasting in your curriculum yet? What is it and when would engineers have to perform controlled blasts? “In my experience as a Civil Engineer thus far, I have not been directly involved in controlled blasting. My knowledge regarding the topic is that it is a complex activity that needs to be monitored carefully in order to ensure that it runs smoothly. If the necessary precautions are not taken, there could be disastrous effects.